This server has made me happy each time I get on, first i get a daily that helps me on my day even better, then my farms cow hop on to help me with finding a legendary and they are the most helpful people i know and they make the server experience even better, people on this server make feel like a community each time i make contact with them in the wild. 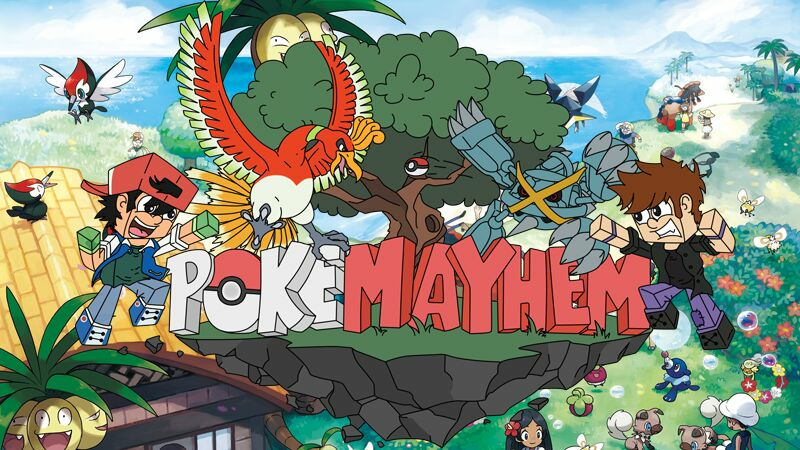 Community: The PokeMayhem Community is very strong. By strong, I mean that is holds together very well, and stands great. In the time I've spent on the server, I've only seen a little amount of people quit. If you want to ask a question, you go ahead. You're almost bound to get an answer from a player. Staff: The Staff are very nice and friendly. The staff may become your friends on the way, they talk with alot of people. If you have a problem, they will help you. Support is very fast, and your problems will also get dealt with there. For this part, I'd like to say, that I've never played on a more smooth Pixelmon server. I close to never have any lag. I come from the Scandinavian Area, and I have 100 ping, but I can't feel it. For uptime, the server is always up. There is a main problem for people with ranks. /vaultmenu is very glitchy, and your items may vanish. If your items vanish, support is of course very great in this incident. I have some suggestions too. I would very like there to be actual gym leaders. Fighting real people just makes it feel alot better to win, it makes you more proud in some way. Even though /pwiki is very usefull, it does lack Pokémon. In my case, /pwiki is my only hope to find spawnrates and stuff. To finish off this topic, I'd just like to say, even though it's kind of obvious, try another plugin for vaults. The server is an all-timer for me. Pretty much everything is good about it. I can't really complain. It was my pleasure to write you this review, and I hope you took my words to consideration. I *love* this server it's full of things to do, although I've mainly played on Neo, one of the servers in-game you can choose from, there's a lot you can do and it'll keep you occupied for hours! The player base is great and the players you play with are kind and lighthearted. The staff team is really nice and it's really easy to make friends with them as long as you're nice back. I personally have only seen two get a severe punishment in the 4-5 months I've played. Even if you don't want to pay to get a higher rank on the server you have options such as ProTrainer and Master as long as you meet the requirements to get them. On Neo, they have almost all of the Gen 7 pokemon. (I think it's just a few legendaries they don't have but I may be wrong.) You can play on the server using Pixelmon Generations (Gen 7 Pokemon) to get on Neo, a Showdown server and Ultra. Using Pixelmon Reforged (Gen 6 Pokemon) you can get on Origins and another Showdown server. Although, even though this server is really great, it has its downfalls like every other server. The server has a few lag spikes every now and again and it does crash every now and again (unless you fix it which there is a simple way to fix it.) Other than that I don't see anything else wrong with how the server is run. So I really suggest playing. That's my review of this amazing server, if you didn't figure it out yet, the server IP is play.pokemayhem.com and it can be played on Pixelmon Reforged and Pixelmon Generations Official on the Technic Launcher! If you would like you can also get it on Forge, here's a step to step tutorial on how to get it made by an admin on the server, Khione https://www.youtube.com/watch?v=KuxqcqvwCSg (Pixelmon Generations). This has to be one of the best servers I have played on out of any server in the past, you will never meet a better or friendlier group of people anywhere else. The staff is second to none because there is always one on to help you with any situation I think all the staff are great in general and have nothing bad at all to say about them, and the community is amazing, never thought I would become so involved, if its helping players build a home/clear out an area or even letting them test their new pokemon team out in a battle. there is always something to do from battling other members of the community or a coordinated event by the staff. I have had so much fun playing on this server and it is well and truly my favourite one by far, the landscape and scenery looks beautiful with massive legendary pokemon flying over the spawn. Where to start? Pokemayhem is a diverse and expansive pixelmon server network, running both Generations and Reforged versions of pixelmon. The network runs 2 showdown servers, 1 Reforged server and 2 Generations servers. The servers have regular tournaments, from OP tourneys, to legendary ones, with a wide variety of players taking part, from experienced to new. The community is also extremely friendly and will help you with any questions you might have, whether they are helper or not, furthermore the staff very useful in aiding with problems, and most importantly are approachable when you do have problems. Nothing from the store could be classed as pay to win in my opinion, which I love as it makes the server more balanced and competitive for all players, no matter your personal situation. One thing that lowers my rating of the server is there are sometimes bugs with a few of the plugins, however if a problem occurs staff are always more than happy to help. I started playing on this server over this past summer after previously playing on another server with the Pixelmon mod. I have hopped around between servers up until playing on PokeMayhem! This server really has it all. In my opinion the server is more than fair with rewards, claim sizes, amenities such as the quarry, mansion, etc. It's challenging enough where you have to put in the work to get what you want out of it, but not so easy that you get bored of it. I think for me the most important thing is that this server has an extremely balanced economy. Many of the other servers I have played on prior to PokeMayhem had unfair and unbalanced economies, where if you didn't "know" a mod or someone else who had some pull on the server you were basically stuck with no money, never getting a chance to capture legends, zip. That is not the case with PokeMayhem. I really have zero complaints about the server, and that is my honest opinion! In the real world I am a out cast, only a few people accept me for who I am. This is mainly due to the fact that I am awkward in social life especially in face-to-face conversations which is manly from my Autistic side. However, on the Minecraft/ Pixelmon Server as well as the Discord Server I feel as I am welcomed to the server and part of their family, which is a feeling I do not come across to often. All I have to say is thank you to this server and to its wonderful staff and its community. Thank you for the joy I have been able to come across on my own adventures on the Origins Server. Thank you for accepting me as one of your own inside of this great community of ours. Sincerely Obito, Red-Eyes, AdminsDecideMyFate, #GimmeShinyCharizards , or any other name I have been introduced as in my travels on this server. I have a lot to say, but don't worry, its all good stuff! I have had different experiences and points of views, I have worked as an admin, I stream & I spend the majority of my time in this server, not once have I ever felt excluded or unwelcome and to me those are 2 of the most important things you could look for in a gaming community. Any concerns or problems I have come across have been dealt with fairly and swiftly with no question, the builds on here are carefully crafted and detailed, which makes a huge impact on gaming enjoyment. There is always something to do whether it be working on my own builds, events coordinated by staff, working through the gyms and battle tower or simply to just enjoy myself. The admins of the group don't segregate themselves from the players, they are always involved in group chats and will lend an ear if you need them, which is great. As is the same in all community's there is always someone who you wont get along with or simply disagree with, but due to the nature of the admins & available commands, these matters are always kept to a minimum and never impact your gaming experience. Out of all the other servers I have tried & tested this one will always come out on top, it has the perfect balance between what you want & what you need. It is thriving with helpful, friendly and downright awesome people, you won't be disappointed! Everyone I've met has been super nice and helpful to me whenever I have a question or are just curious about something and the staff for the server have been nothing but helpful whenever I've had a problem with pixelmon disappearing or losing items. It's been some of the most fun I've had playing pixelmon since when I first played it, I've put more time into playing on the server and the mod more than I ever have. The achievement system is fun to do as well as some of the quests. I'm excited to see what the future holds for the server and can't wait to see what will come out next. My In game tag is NumbN, and honestly I love this server, everybody is so helpful, active, and kind. This server; I feel, has the perfect balance between what you need, and what a player would want while playing it, never too much or too little. The story from what I've played is really engaging and fun to do, and if I have trouble finding the city there's always somebody willing to tp me. It is a great server overall and the best Pixelmon server, and most balanced I found after a handful of days searching, and testing servers(very much worth it!) I hope whoever is reading this finds this helpful, and that they enjoy the server, join and receive the gift of a friendly welcome! When it comes to the story line that the server has, It doesn't follow the common formula of us being put into the shoes of ash ketchum or one of the other main cast, but instead we are some random kid, setting out to their adventure to follow the big trainers. You'll do fetch quests, search for things and ultimatly fight trainers. Most servers will have you follow the pattern of moving town to town, only fighting the gym and facing off with gary from time to time, but with the added story that is added before the gyms, both of you have grown and evolved with time spent traveling and upgrading your skills. This allows people to gain from doing the story, instead of just flying through it and not taking any notes on anything thats going on, however, the moving between towns and some location finding quests can be confusing, especially to people who may either be young, or do not pick up on information that easily. It could be a bit more user friendly in a way of giving directions, but it may all be to build world and character. For the amount of time that I have been on the server, I've managed to interact with a number of people and for the most part, everybody is informative, helpful and ultimately a great community. The staff are very helpful and have been resourceful with both me and my friends. The amount of effort I have seen to keep the server PG, and the amount of patience they display all gives off an easy going and inviting experience. Despite a few unsavory bunch who came to understand the rules, everything was dealt with swiftly and peacefully. The server itself is great, the community is thriving and noone is toxic to eachother, the story itself displays how much effort the server has put into it, and the staff are very friendly. The many good things about it outweight the few bad ones, but there is always space to improve no matter what. Thanks for reading. The overall quality of the server is magnificent. The amount of work and effort is incredibly detailed in the towns, cities, gyms, is absolutely astonishing. The community is also great, kind, as well as enjoyable to talk to. Everyone has great humor and respect for the other players on the server. Not only that, but the staff is quite active and responsive. There are many opportunities and experiences to showcase on this server from the activity. Not only that, but the server also hosts giveaways, server events, to give everyone an equal opportunity to receive rare items from tournaments, others, and giveaways. It's mind-blowing to see the amount of dedication put into this very server to support the needs of everyone fairly. The staff dedicates so much of their time to equally suffice for our needs here, and they deserve much more love and support. They are always willing to help and the server always tries to find opportunities for you to improve, and try to enjoy the server more. I would like to thank the server for giving me such a great opportunity, because I have had so much fun playing on here since July 2017 because the experiences and bonds I got to make here. The staff are so friendly and helped me so much! It's so hard for me to choose what i dislike about the server. If i have to, I'd have to go with the occasional server lag spike that lasts a few seconds. I know that's not a problem they're able to fix. Another thing is the occasional spammers. Overall this server was 9000/10 and i couldn't recommend it enough! First of all i'd like to thanks the Moderators and Admins for the amazing service they provide for the server. It's unlike i've ever seen on any minecraft server. They are kind, patient and are always willing to help if you're struggeling with something and/or someone. This server also shines in content. At this point in time you have gyms in all types, an Elite 4 and a Champion. Almost every week is a Tournament whit a custom theme where everyone can enter, with prizes for the 3 winners. Newly introduced to the server are contests. I don't know how they will fit in, but with this staff, i am sure it will work out really good. This server also has a custom achievement system which is amazing. The rewards are good and balanced, and you'll be focussed on completing them. As for the community i have 1 word. Amazing. The people on the server are nice, helpfull and overall chatty. The server has a own Discord, where you can find people actively in voice- and textchat almost 24/7. Overall i consider this server one of the best pixelmon / minecraft servers out there and give it a 5/5, if there was a way i could give it a 6/5 i would. I won't be leaving this server any time soon, since the content keeps flowing in. The server is great (one of the best out there), I've been playing on the server for over 2 days and i enjoyed the time that i had. I also met some great people at their discord server. The staff is also great, they do events, giveaways and more. Nicholethewolf - This is by far the best pixelmon server that I have played on. The staff is helpful and 95% of the time there is a mod on. The people aren't toxic, and most of the time your questions are answered. In comparison to other popular pixelmon servers, its even better. I played on wispens server and I instantly left. The small and big things this server has that wispens doesn't, this server spawns you with running boots, and wispens doesn't. Which ik isn't very important, but I feel so slow, even if the people there were helpful I wouldn't be able to stay because it feels to much like a running simulator. I asked a simple question, "are there beginner kits I can do" 3 times, and not one person answered me. Not to mention that the store prices are lower then most of the other pixelmon stores that I know of. All around I would rate this server 9/10 and I do think it can be improved. I am only writing this for the rewards but I honestly feel it. The big point is, this server takes care of you and gives you the basic things you need to get a good start. Its easier to grow and earn money is what I am saying. Also the rewards from crates are way better. The starter crate on wispens server gives 2 rare candies max, and that's the best reward. Where the starter crate for us (mystic) could give 16 rare candies. that's all I have to say, yea ik its kind of out of order. This server is great. The staff are great great people and very helpful and informative where possible. The server is filled with great people all the time. Everyone works together to help each other out. All rules of the server show the server to be very polite and PG to help with possible younger players on it. There is a great variety of things to do and is fun for all types of pixelmon players; if you want to chill out and catch some Pokemon while doing survival it has that, if you want to beat some gyms and be strong, if you want to have some fun talking to people and involving yourself into a community. This server really helps bring people together, there is rarely arguments and heated discussions which really helps make the server a great environment to be in. Really if you are looking for something to sit down and game for 4 hours straight and never get bored, this server is the perfect thing for you. It even rewards the players for just being on the server! This is a great pixelmon server and I don't see myself ever wanting to quit the server through boredem. In conclusion: great fun server with lots to do, even better staff, and just a brilliant community the server has accumulated. (IGN: RotagZqyarri) I came across this server a couple months ago. My friends and I had been jumping from server to server for days, looking for a good one. Every one we came across had a downside in multiple departments, from having a bad Market to low Pokemon Spawn rates and even incredible lag spikes. But when I found this one, we were greatly pleased by what it had to offer, and that it was lag free. The staff team is friendly and active, there are numerous events to participate in, and the added in features, such as the Mine and EV Training, makethe server even more enjoyable. Great staff and an awesome owner who socializes and communicates with his players. Some great custom quests and always working to increase stability of the server. Definitely one of the best servers I've been on. Honestly this server is one of the best Pixelmon servers I've ever played on. Last time I played Pixelmon was WAYYY back in Minecraft version 1.6.4. Obviously I had a lot of question when I first joined the server, not only about Pixelmon and how it evolved but also Minecraft too. The staff and playerbase was super knowledgeable and helpful with any question I threw at them. 11/10 would recommend this server, and if you do decide to join, look for WuckingFeeb (Nickname is Weeb). That's my IGN and I'd love to expand my friend group! I can guarantee this is one of the most active server with consistent updates and helpful staff that will dedicate as much of their time to provide assistance. The server offers a lenient way of play with custom quests and if there are suggestions, the staff will consider and get back to you ASAP. I love this server! Well done! I love this server ! The moderators are nice and patient. I played a lot of pixelmon server and this one is the best ! Everything is very well explained and the community is very kind. There are players from many countries! United States, France, Italy, Netherlands, England, Belgium, Germany and many more ! Pokemayhem is the one server that has it all - decent, fair staff, a beautiful map, rapidly growing playerbase, the list goes on and on. It's got piles upon piles of well-balanced opportunities for both brand-new players and veterans alike, making for a friendly, helpful community that is an absolute wonder to be a part of. New additions to the server come thick and fast with the server's owner: MageFX and his team coordinating everything. It seems the only aim the server has is to enrich the player and immerse them into their world of Pixelmon - which from experience I can tell you is a great one! Join in on the fun :) You'll be cheerily welcomed I assure you. I really do love this server and can fully recommend it for anyone who wants to play Pixelmon. The thing I like the most about this server are the people. It isn't like you play for yourself on the server, more you play WITH all different people (even new people). All people on this server are so helpful, they always answer if you have a question and maybe you're gonna hunt Pokemon together within the next seconds. Also the server plugins like the "hunt"-plugin give you more and more goals you want to fullfill. Here, you can really enjoy playing Pokemon with a Friend together. An amazing super friendly pixelmon server.